There is too much snow / ice / sand, tree limbs, downed power lines, etc. to do any biking around here. I checked out the Minuteman Bikeway, but it is snow / ice / leaf / branch covered from Bedford to Lexington at least. So, let's do a coast ride from Hampton North Beach to Portsmouth. Although I didn't personally check it out, the attached snow cover map indicates that it is clear. The forecast for Portsmouth calls for SUNNY, little wind, and 40 degrees to begin and 46 when we get back. Not bad for November! With everyone talking about SNOW, I thought it would be a good idea to forward this. You can order your 2011/2012 Wachusett Mountain Season Pass through the AdventuRides GPS* Group and save $110. I usually get a Bronze Pass that works on all non-holiday weekdays and all nights for only $239. Regular lift ticket are $53, so ski just 5 times and you are ahead, and no waiting in ticket lines either. Do I sound like a Wachusett salesman or what? It really is a great deal and skiing weekday mornings at Wachusett will spoil you forever with freshly groomed snow, no lift lines, and friendly, civilized fellow skiers. Just go to this website and use the name ADVENTURIDES for the group name. A little snow in the forecast is a good reminder that it's time to buy your Season Pass. Start a group or join a group - all you need is 4 or more people! Purchase your pass before Nov. 16th and save $100! Join us November 5th as we get fired up for winter! Be the first to watch the premiere of TGR's newest ski and ride film "One for the Road". Your entire family will enjoy an evening full of live music by Five Hole, Fire Dance Performances, sizzling food specials and a whole lot more! An evening for women only, November 4th. Indulge on food, wine & conversation in front of the roaring fire! Learn about the new tips and trends for the upcoming season. Enjoy special Women's only discounts on equipment, tune-ups and more. MORE INFO. Please be sure to add wachusettmt@wachusett.com to your address book to ensure further emails. If you'd like to receive e-mails at another address or change your subscriptions, update your preferences here. To be removed from this list unsubscribe here. I hate to miss a sunny day, but ice, snow, sanded roads and bicycles don't mix well. I'm a bit concerned by the possibility of snow and ice on the ground tomorrow morning, ... not to mention the cold. So, I think we should start the ride at 10:30 AM and move the starting point UP the hill to Bower's Spring to shorten up the ride a bit while preserving the scenic possibilities. There was a PortaPotty at the parking lot when I checked yesterday. Bower's Spring is about 3 miles South of Harvard Center on Bolton Road. Just after you cross into Bolton, Flanagan Road will be on your right. The Fitness Ride will leave at 10:30 AM. The good news is that its supposed to be SUNNY on Friday! The bad news is that it may only be in the low 30s when we start. The worse news it that it could snow Thursday night. Stay tuned. More good news is that we won't be climbing Prospect Hill on this ride. Of course we will miss Fruitlands Museum and the goats on Madigan Lane as well as the Category 5 hill. However, we will stop at Bare Hill Pond to admire the scenery before we head UP to the Wataquadock Hills and enjoy the distance mountain views. On the way back we will pass many scenic farms while staying up on the ridge to minimize the hills. We will stop at Bower Springs for a PortaPotty break, and we can go down to the pond if we have time. Then its a 4 mile roller coaster ride back to Harvard Center on Bolton Road. The Friday Fitness Ride will leave at 9:30 AM. Route Map - Harvard Hills. Elevation Gain = 600 feet (not that bad, especially for Harvard). Rough Surface = 1 mile. After a surprisingly nice day on Monday, tomorrow's weather is looking particularly nasty. The forecast for Rutland calls for rain and snow (???) in the morning and just rain in the afternoon. Unless something changes dramatically, I would say the ride will be postponed. I'll make the call tomorrow morning. We will have lunch at the NEW Heavy Evie's Diner in Rutland. Lunch is at mile 22 and if people prefer to get back earlier, I can provide some simple directions and a map. You will still see Altavista Farm and the bison and zoom mostly downhill back to Jefferson. Unpaved = 15 miles (smooth crushed rock). AR Index = Roughly equal to 36 flat, paved miles. Well, the Monday forecast is looking better. Currently. they are saying Mostly to Partly Cloudy, low 50s to low 60s, and light winds. I'm trying a new idea, the Monday Recreation Rides will be cut down versions of previous Fitness / Exploration Rides, so everyone can enjoy some new territory. It doesn't look like an outdoor dining day, but we will start and have lunch at the Horseshoe Pub in Hudson. According to Google, it is exactly 30 minutes from Groton Center to Hudson. The morning Recreation Ride will explore the Assebet River Rail Trail to the Assebet River National Wildlife Refuge. From there we will visit Lake Boone, ride past Honey Pot Hill Orchards and BOO them since they are blocking the ARRT, then see how the other half lives on the Stow golf courses. The afternoon ride will take us over the Assebet River on a footbridge on our way to cute alpacas and then to the church restoration in Berlin Center. From there we will avoid Salomon Pond Mall as much as possible on our way to the paved (and downhill) portion of the ARRT. Elevation Gain = 200 feet (easy) There is only one significant hill. Unpaved = 2 1/2 miles. Mostly smooth. Lunch is at 11:30 AM at The Horseshoe Pub next to our starting point. AR Index = Roughly equal to 21 flat paved miles. The weather for tomorrow may not be a top 10, but a top 20 day for sure. Its supposed to be Sunny, breezy, and mid 50s. We will travel to Atlantic Union College, George Hill, Maharishi Ayurveta Health Center, Sterling National Country Club, Davis Farmland, "Mary Had A Little Lamb", Mass Central Rail Trail, Wachusett Reservoir, Clinton Center, Old Lancaster Girl's Industrial School, and Lancaster Center (established 1653, two years before Groton). Starting Point Map - Lancaster - Thayer Field. Route Map - Lancaster - MCRT - Wachusett Dam. Elevation Gain = 700 feet (more difficult) includes 1 Cat 5 (easiest category) hill. Unpaved = 3 Miles, but very smooth. Equipment - Any sturdy, well maintained bike will work. I plan to bring my road bike. AR Index = Roughly equivalent to 32 flat, paved miles. After a nearly perfect day on Monday, tomorrow's weather is looking particularly nasty. The forecast for Rutland calls for mid 50s, windy and rain by noon. 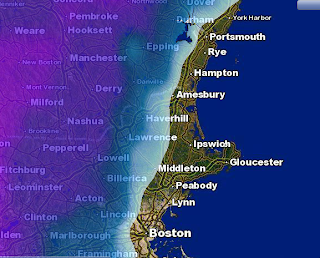 Its too far to drive out there (45 minutes from Groton) to ride in crummy conditions. I DO want to ride though, if the rain holds off a bit. So, how about an informal ride from Groton Center? We will leave Groton Center at 9:30 AM. We will be back probably before 11:30 AM or before we get too wet / cold / hungry. Starting Point Map = Groton Center. Distance = Until it starts raining??? Equipment = Ride what ya' brung. Well, the forecast for Monday is looking better all the time. Right now it looks like Sunny and Breezy with temps from the mid 50s in the morning to the mid 60s in the afternoon. The morning ride will feature llamas, Long Pond, Nagog Hill Orchards, and Nagog Pond. It will be the easier of the Monday rides. The afternoon ride will travel to the Assebet River and then explore 5 miles of gated roads in the Assebet River National Wildlife Refuge. On the way back we will ride a bit of the (unpaved) Assebet River Rail Trail and visit Maynard. We will need to keep moving to get back on time. Route Map = West Acton - Littleton. Equipment = Any sturdy, well maintained bike will work. I plan to bring my road bike. Lunch will be at 11:30 AM from Idylwilde Farms just around the corner from the starting point. On Monday, October 17th - West Acton. The afternoon Recreation Ride will ride will leave at 12:30 PM. We will return by 2:30 PM, although we will need to keep moving. Starting Point Map = Elm Street Playground, West Acton. Route Map = West Acton - ARNWR. Unpaved = 3 miles (mostly smooth - some sand). AR Index = Roughly equal to 20 flat, paved miles. On Wednesday, October 19th - Jefferson. If the weather cooperates, we will explore the Mass Central Rail Trail from Holden to Barre. Stay Tuned. This ride will explore Lancaster (which was established 2 years before Groton), George Hill, Davis' Farmland, Mary Had A Little Lamb, a bit of the beautiful Mass Central Rail Trail, Wachusett Reservoir and Dam, Clinton Center, and if we have time, the old Girl's Reformatory School (whew). Unfortunately, I will not be able to stay for lunch due to parent / teacher conferences. Bring a warmth layer and a wind / drizzle layer. We'll have a yummy lunch too. Well, I hope you haven't gotten used to the weather of the last few days :-( The forecast for tomorrow is Cloudy with temps in the mid 50s to about 60 degrees. The winds will be light out of the east. This route starts on the Nissitissit River where it leaves Potanipo Pond. We will follow a tiny bit of the Potanipo Rail Trail on our way to the old train station and Brookline Center. From there we encounter our first Cat 5 hill (freshly paved!) and with any luck we can stop by John Weidman's sculpture studio. Then we will cruise past Rocky Pond on our way to Federal Hill where we encounter our last Cat 5 hill (gravel and dirt). At the top of the hill we will stop at the ghost town of Monson Center which has been partially restored. From there we will enjoy beautiful views from Federal Hill Road on our way to Lunch at Amigos Mexican Cantina in Milford. There was a bit of fall colors on our Monday ride in NH. After crossing a 120 year old pedestrian suspension bridge over the Souhegan River we will head back to Potanipo. There is about a mile and a half of fairly civilized Potanipo Rail Trail on the way back that we may explore. Route Map - Brookline - Potanipo - Milford. Elevation Gain - 700 feet (more difficult). Including 2 Cat 5 (easiest category) hills. Equipment - Any sturdy, well maintained bike will work. I will probably bring my road bike. I hope you are all out enjoying this beautiful Indian Summer weather! The Chili Cook-Off at Devens is tomorrow (Sunday) and I have planned a ride to take advantage of it. We will ride for about 1 1/2 hours and visit historic Shirley Center on the way to chili and beer. Then its about 1/2 hour back to Groton on the Nashua River Rail Trail. The Special Chili Cook-Off Ride will leave at NOON. We should be back by 4:00 PM. Starting Point Map - Groton Center - Beware of the Groton Precision Parking Police! Route Map - Groton - Chili Cook-Off Devens. AR Index = Roughly equal to 21 flat, paved miles. On Columbus Day we will meet in Ashby Common and ride UP and over to New Ipswich and ride past the historic Barrett House on our way to up close and personal views of Mount Watatic. From there, we will zip DOWN back to Ashby with amazing views and multiple lakes. We can get lunch from the Ashby General Store. The Special Columbus Day Ride will leave at 9:30 AM. Starting Point Map - Ashby Common. Route Map - Ashby - New Ipswich. Elevation Gain = 700 feet. Equipment - Any sturdy, well maintained bike will work, but the "pavement" tends to be rough. A Sparkling Day, but chilly to start! The original plan was going to use the Nashua River Rail Trail on the way back, but there is no school in Groton on Friday and the nice weather could make for a crowded trail. So, I moved the starting point to West Groton and I was able to extend the ride farther into NH and see some new territory. We will cross the Nissitissit and Squannacook Rivers many times and at least today they are nearing flood stage. We will also explore the area north of Townsend State Forest in New Hampshire, where we have never done a ride before. Perhaps the cold nights in the forecast will get some fall color going. You will notice that there are two category 5 (easiest category) hills on the ride. The first one is just long, not steep. The second is steep but not very long. We did a 5 1/2 mile long category 3 (middle category) hill today and everyone survived. We should return by 1:00 PM - The ride is a bit longer than usual and I didn't want to be pressed for time. Unpaved = 1 mile. It is a bit rough in spots, but walking will fix that problem. AR Index = Roughly 34 flat, paved miles. Are you looking for something to do outside after AdventuRides' Fall season ends? Well, have I got a deal for you! You can order your 2011/2012 Wachusett Mountain Season Pass through the AdventuRides GPS* Group. I usually get a Bronze Pass that works on all non-holiday weekdays and all nights for only $239. Regular lift ticket are $53, so ski just 5 times and you are ahead, and no waiting in ticket lines either. Do I sound like a Wachusett salesman or what? This coming Sunday, October 9th the Devens Grill will present the 7th annual Charity Chili Cook-Off to benefit the Autism Resource Center of Central Mass. Donation is $10.00 per person. Last year, Alex and I did a ride that stopped by for a bunch of chili and Wachusett Brewery beer on tap. It was a lot of fun! So, this year, I am planing an easy 20 miles sort of ride starting from Groton Center at Noon and stopping by Devens Common on the way back. PS. The weather forecast is looking quite summery at this point. Bring a warmth layer and a wind layer. Its supposed to be Partly Cloudy, Breezy, and around 60 degrees tomorrow. You will want a warmth layer and a wind layer to start the day at least. The ride is not as tough as it sounds, but there will be a bunch of climbing hills in the morning and a bit after lunch. The payback is outstanding views and a lovely downhill cruise back to Townsend. We will meet about 1/2 mile past Townsend Center and ride UP to Ashby then DOWN to historic New Ipswich "High Bridge" and then on to Greenville for lunch. Lunch will be at the Marcus P's Diner Plus in Greenville. After lunch, we have a steady climb up to amazing views from Adams Hill. We should be able to see Boston (almost 50 miles away). From there it is almost all DOWN. We will zip through Mason, past the cascades on Rocky Brook, and then enjoy a breezy cruise back down to Townsend. The ride will be about 25 miles and 1050 feet vertical with a category 3 hill (5 miles long, but not real steep) getting up to the plateau, but then its rolling hills and beautiful distant views. After lunch we have a cat 5 hill (easiest category). Its all on road, but there are a few gravel / dirt roads on the way. I plan to bring my road bike, or at least my road bike tires. Unpaved = 1 mile - to the Cascades which should be wild tomorrow. Bring your rain gear and something warm. Well, the weather forecast has improved to mostly cloudy with temps around 60. A few showers are forecast after lunch, but it doesn't look significant. We will meet at the Harvard Track on Lancaster County Road behind the Post Office, NOT at the Harvard Soccer Fields on Depot Road. The morning ride will visit Bare Hill Pond (unless we get thrown out) and take a quiet dirt road around part of the pond. From there we ride past apple orchards on our way to GOATS and the wonderful views from the top of Prospect Hill. Then is a breezy ride down the hill and back to the track via a gravel path. The afternoon ride will go the opposite direction to Littleton Depot for an invigorating climb UP Oak Hill Road. It is a Cat 5 (the easiest category) hill mostly because of the distance. Its not very steep and the scenery is quite nice. Then we will visit Carlson Orchards on our way to quaint Harvard Center and then back to the track via a gravel path. Route Map - Harvard - Prospect Hill. Lunch will be at Sorrento's. I plan to ride over on some back road with just a little time spent on Route 110. Route Map - Harvard - Oak Hill. Distance = 13 1/2 miles. I'm thinking of doing the Greenville trip, but we will see what the weather turns out to be. I'm thinking of doing the Wallace Hill route to Brookline, NH, but they were paving the road last time I was there. Stay tuned.